New Socialist Initiative (NSI) strongly condemns the gruesome massacre of Bengali speaking Muslims in the Bodoland Territorial Autonomous Districts (BTAD) in Assam, which has witnessed the resurgence of the ugly head of ethnic violence. As per latest official reports, 44 people have been killed, the majority being women and children, while several have been injured and many are missing. On the evening of 1st May at 7.30 pm, 8 armed Bodo youths riding on 4 bicycles entered a house in Narasinghbari village in Baksa District and fired gunshots. The next day (2nd May), allegedly 40 Bodo militants surrounded 77 houses in Narayanguri village in the same district and fired indiscriminately. Until now 36 dead bodies have been found. According to district administration 15 people are still missing, among them 12 children and 3 women. 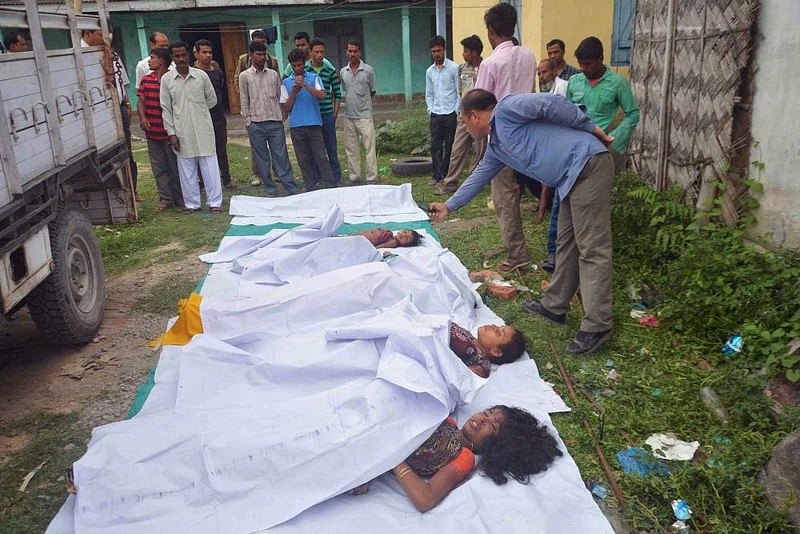 Simultaneously, in Balapara village in Kokrajhar district at around 12.30 am on 2nd May, armed Bodo youths killed 8 people. The survivors in Baksa district told that the death toll will substantially increase as the militants killed and threw the dead bodies into the Beki River that flows through the area. Even though the Assam government and BTAD administration blame National Democratic Front of Bodoland’s Songbijit faction for the carnage, survivors and people from the affected communities have refuted the government’s claim and asserted that former cadres of Bodo Liberation Tigers (BLT) were involved in the massacre. They strongly feel that the ‘planned’ massacre was a reprisal for not voting for the Bodo People’s Front (BPF) candidate Chandan Brahma, who is a powerful minister in the Assam State government, in the Lok Sabha election for Kokrajhar constituency held on 24th of April. Chandan Brahma is in the fray against, among others, sitting BPF MP Sansuma Khungur Bwismwithiary who is contesting as an independent candidate this time. The media statement given by Pramila Rani Brahma, former Minister in the Assam Government and present BPF MLA from the Kokrajhar East constituency, on 30th of April in which she accused the Muslims of not voting for Chandan Brahma, reasserts the survivors’ claims. Ms. Brahma’s speculation amounted to dividing the populace on the basis of religion and is in violation of the law as it amounts to promoting hatred, ill-will or animosity on the basis of religion. Survivors have also intimated that the attack was carried out under the leadership of Amiya Brahma, Ranger of Basbari Forest Range, and that the assaulters used .303 rifles belonging to the Forest Department. Since the massacre, Amiya Brahma along with several forest guards and former militants were arrested for involvement in the massacre. Naba Saraniya, a former commander of United Liberation Front of Assam (ULFA) and the non-Bodo consensus candidate of Sanmilita Janagosthiya Aikkyamancha (SJA) which is an amalgamation of at least 20 ethnic and linguistic groups that form 74% of the total population in the BTAD areas, is widely tipped by poll analysts to win the election. People from the affected communities have also affirmed that they voted en masse for Mr. Saraniya. Despite perceived threats of violence, voting amongst non-Bodos is reported to be about 65% and in certain pockets where non-Bodos are a majority, voting percentage even crossed the 90% mark. The likely victory of a non-Bodo candidate is a significant change in the politics of the region in which the BPF and its predecessors had strongly dominated for the last couple of decades. It should also be noted that before the violence on the 1st and 2nd of May, tensions had begun to strongly manifest in the region. Since the 25th of April, hundreds of Muslim people from the villages under the Harbhanga polling booth had been harassed by the police. This was done in allegations over the death of police personnel on election duty the day before, owing to a rumor of an Electronic Voting Machine (EVM) being rigged. The tensions that were evidently building up since the polling day (14th April) culminated in the massacre of 1st and 2nd May where perpetrators resorted to extreme violence, entering into indiscriminate killings including women, children and the elderly. The worsening of the situation in the region was either not comprehended or left to chance by the state administration. Despite tensions building up, the inability to prevent the massacre brings to fore the utter failure and short-sightedness on part of the Assam Government. It is condemnable that to divert attention from its failure Assam government is mulling arming Bengali-speaking Muslims in BTAD area with licensed guns and has asked for applications from villagers. Forest minister Rockybul Hussain told media on Sunday that for their self-defense, Bengali speaking Muslims villagers should be given licensed arms by the state government. He has been quoted to have said that, “Since the home department in Bodoland area is under the state government, the government can provide licensed arms if anyone applies for it.” The minister and the Assam government should know better than others that the need of the hour is to de-arm BTAD completely rather than arming it further. While innocent civilians are massacred, certain sections of media and society have twisted the issue and are raising the bogey of illegal Bangladeshi immigrants to cover up the causes of the violence. This is done to gain political mileage out of a tragedy as the Bengali speaking Muslims living in Assam have historically been easy to victimize and made scapegoats out of. Various political parties and ethnic groups have time and again played the game of discrimination and accusation solely targeting the Bengali speaking Muslims, the most recent example being Bharatiya Janata Party’s Prime Ministerial candidate, Narendra Modi. Also one should be very careful not to fall into the trap of equating the whole of the Bodo community with militancy and terror. No community is homogeneous to the extent it is made out to be. Within the Bodo community there are divergent voices, beliefs, ideologies and aspirations. The fact that there were five Bodo candidates, including the two mentioned above, contesting from the same constituency affirms the same. What one needs to question and fight against is the economic and political hegemony of the people in power. It is the nexus between the tiny Bodo ruling elite and the ruling dispensation in Assam which pits ordinary Bodo people against similar non-Bodo people. It should also be remembered that historically Bodos have been an oppressed community in Assam, and hence the genuine aspirations of Bodo people should be respected. However, the genuine aspirations of the Bodo people have been completely hijacked by the politics of power mongering and of vested interests. This ruling elite can further it's interest only at the cost of the rights of other ethnic groups as is being done for a decade by pitting ordinary Bodo people against similar non-Bodo people of the region. Further the genuine economic and social interests of the larger Bodo community remain neglected and throttled in this play of power and privilege. It is time to re-imagine the idea of Bodoland for a better future. It is time to demand that BTC Accord be re-worked and revised so that the genuine democratic aspirations of all sections of population are upheld and realised. A high level judicial enquiry be instituted, as state (Assam) security forces have utterly failed to prevent the massacre and can not be relied upon to carry out fair and thorough investigations. Adequate compensation and rehabilitation package be provided to families of deceased and injured. Secured relief camps with adequate standards be provided to the victims till they feel confident to return to their villages. Instead of arming further, de-arm BTAD immediately by seizing all arms and ammunition. FIR be registered against Pramila Rani Brahma for her inflammatory public remarks. Since it has come to light that guns belonging to forest department have been used in the massacre and involvement of forest guards have been suspected, investigate the possible involvement of official and executive members of the forest department of Bodoland Territorial Council. Rework and revise the BTC accord so that the genuine democratic aspirations of all sections of population are upheld and realized. Please confirm your verdict with proof that the victims were not really illegal bangladeshi settlers. Do not take the form of paid media who report on the basis of vested interest. You should justify your claims, or should not write at all. Another pseudo-intellectual write up. So ill informed. So what if they were bangladeshis. Was it right to have killed so brutally. Don't all religions teach us about love and humanity. What's the point of education if our conscience can't guide us. What if our families were massacred like this? And why little children? We all should be massacred like this only then we will learn our lesson. I mean why children? Oh God kill us all.